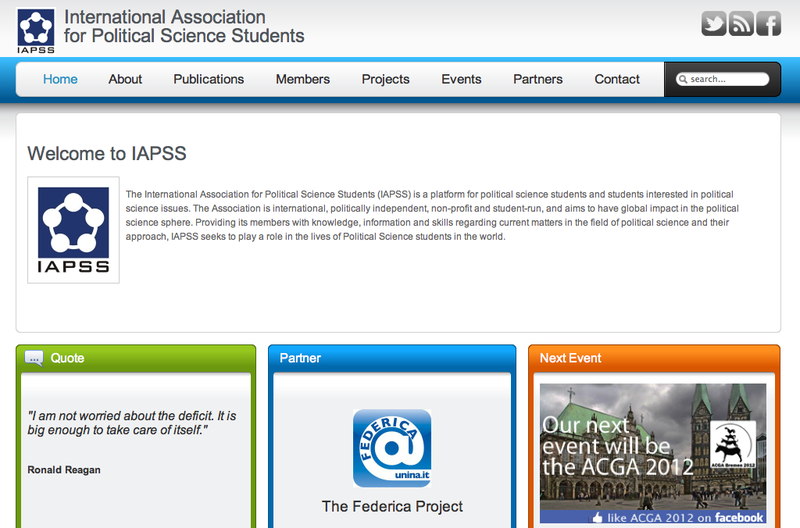 With more than 15,000 members in over 80 countries, the American Political Science Association (APSA) has developed a highly professional website – renewed in 2005 – mainly focused on the internal working of this association. Its activities are however extremely broad, ranging from publications and articles to teaching, from conferences and meetings advertising to scholarly networks and career opportunities, with a huge quantity of information provided. As to retrieval services, APSA offers a directory of Associations (worldwide) and PS Departments, research institutes as well as links to academic journals and discussion lists and to PROL (an online repository containing PS conference papers). 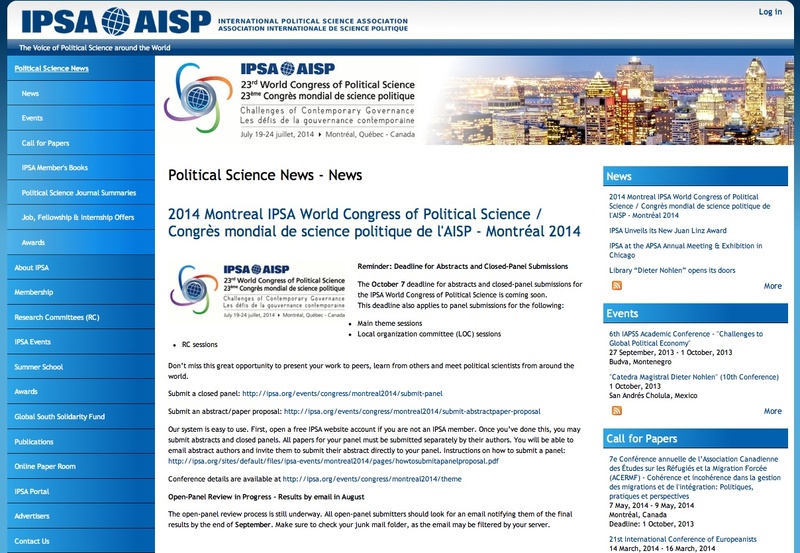 Although site navigation is free, publication retrieval requires APSA membership. 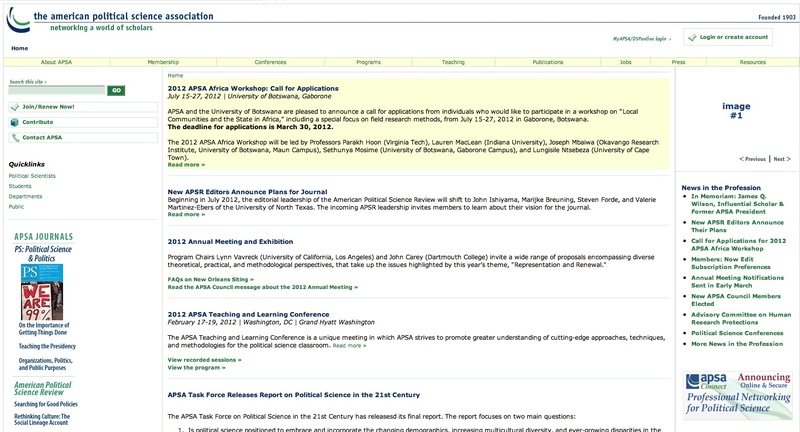 Visitors can yet access tables of contents and some reading samples, as well as selected archive papers, while APSA members can retrieve full-text versions of all APSA publications (APRS – PS – Perspective). APSA members can also access, through an additional registration fee, the historical collection of the American Political Science Review and have some other online services. The Asociación Chilena de Ciencia Política (ACCP) aims at promoting Political Science in Chile as an independent and scientific discipline. The organization’s activity is focused on fostering individual member’s autonomy, while at the same time creating an information pool for other professionals, scholars and students. The ACCP main mission is to push for the recognition of PS as a professional discipline, thus working with national universities, study centers and different kinds of organizations toward that goal. The ACCP also aims at facilitating local investigative research and news spreading about new trends and schools active in other countries, thus connecting the national scene with PS professionals and academics around the world. 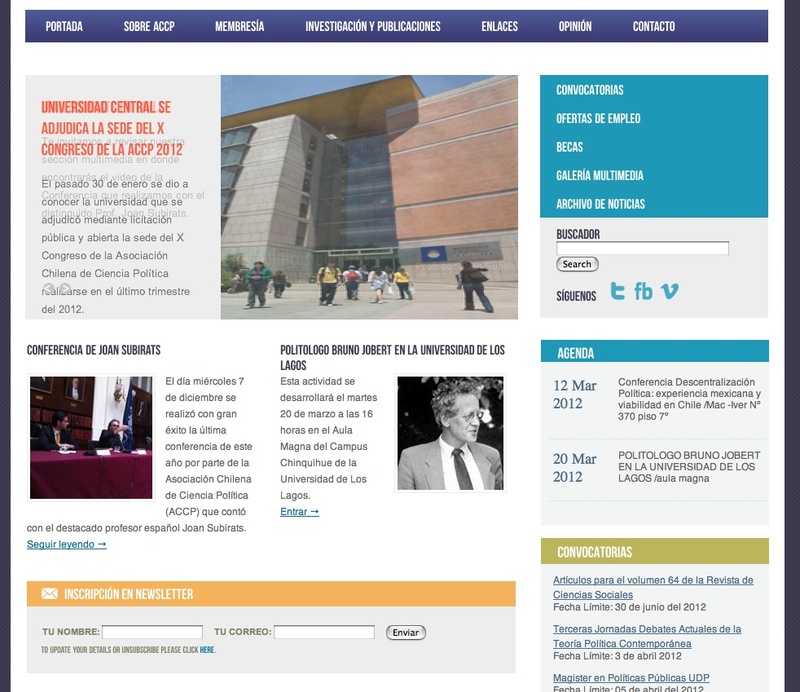 Mostly centered on ACCP activities and initiatives, the ACCP’s website provides easily and freely available information, mostly centered on PS matters particularly useful for South America’s scholars. This website shows a good updating rate for news items, while several pages are still under construction. Some book abstracts plus a good amount of external links to PS national and international schools and organizations are also provided. The Brazilian Political Science Association (ABCP), is the national scientific association of PS scholars, professionals and graduate students of Brazil. Founded in 1986 and re-activated in 1996, its aim is to promote the exchange of ideas and to debate different issues in the field of Political Science within Brazil and Latin America. Currently the ABCP counts over 360 members. Through this website, users can access the ABCP biannual congress programs, some congress proceedings and paper abstracts. Detailed information about the association structure, activities and field research is also provided in the website pages, along with its institutional – national and worldwide – affiliation listings. Also available are direct links pointing to many scientific associations, research support organizations and research centres, as well as pointing to related and useful resources (such as newspapers, political parties, etc. ), along with many national and some international Political Science reviews. 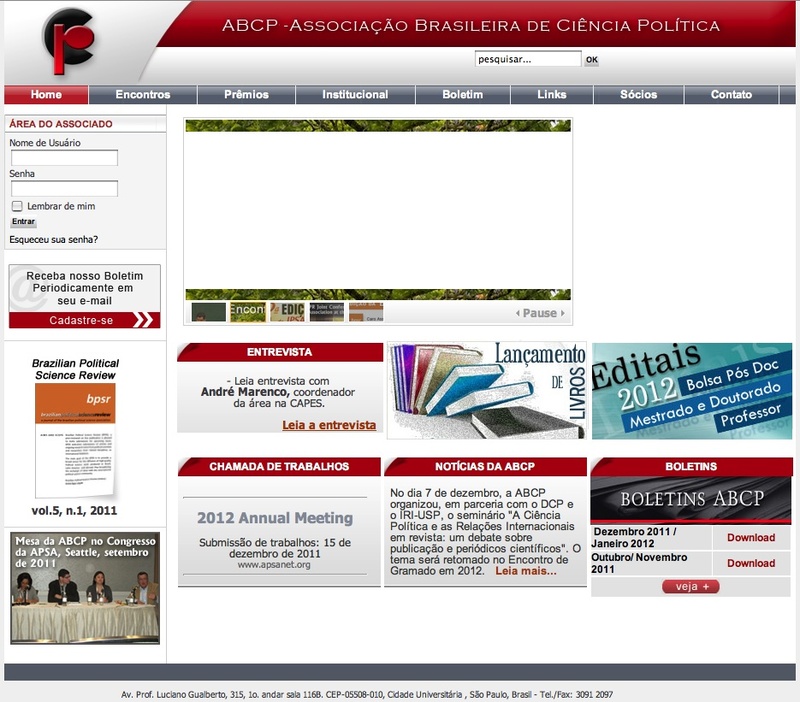 The ABCP site is in Portuguese, with only some basic information and pages also available in English. The general outline is quite simple and easy to navigate, even if a search facility and other navigational tips could surely improve its usability. Founded in 1949, the main goal of the French Association of Political Science (AFSP) is the promotion of French research in the discipline through exchanges and cooperation among scholars, universities and research groups in France as well as at the international level. A founding member of the IPSA, the AFSP is also connected with ECPR and EpsNet. 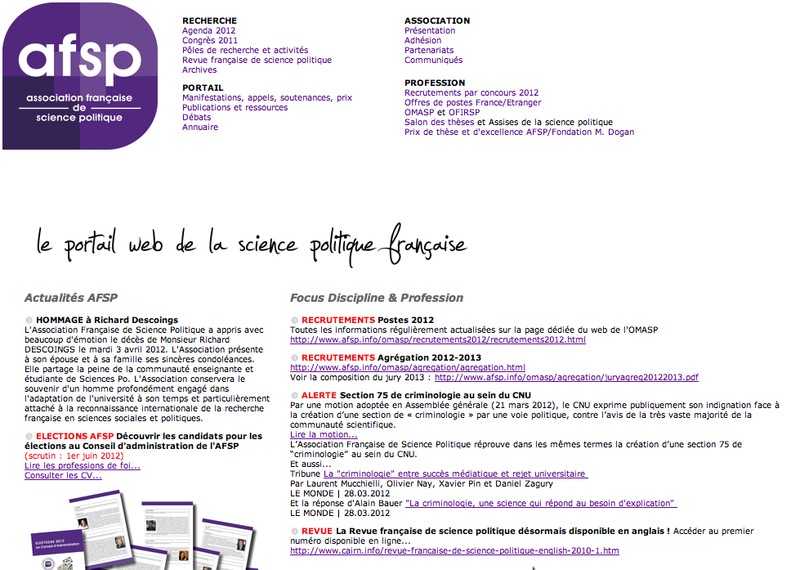 The AFSP wesite, available only in French, provides an archive of seminars and roundtables of the association from 1949 (online texts since 2000), abstracts of French PhD theses in Political Science since 2000, a list of most recent (French) academic publications as well as links to research groups’webpages with programs and papers (where available). French Political Science Review abstracts from 2000 are also provided as well as links to some – mainly French – Political Science journals. Recently, alphabetical and thematic directories of French scholars have been introduced. The AFSP site also gives information about job opportunities, scholarships, calls for papers and seminars, as well as links to some political science associations, to French thematic research centres, and to a few online resources. With advanced search options and a good amount of freely downloadable files, the AFSP website features a clear structure and outlook, thus providing a friendly navigation. 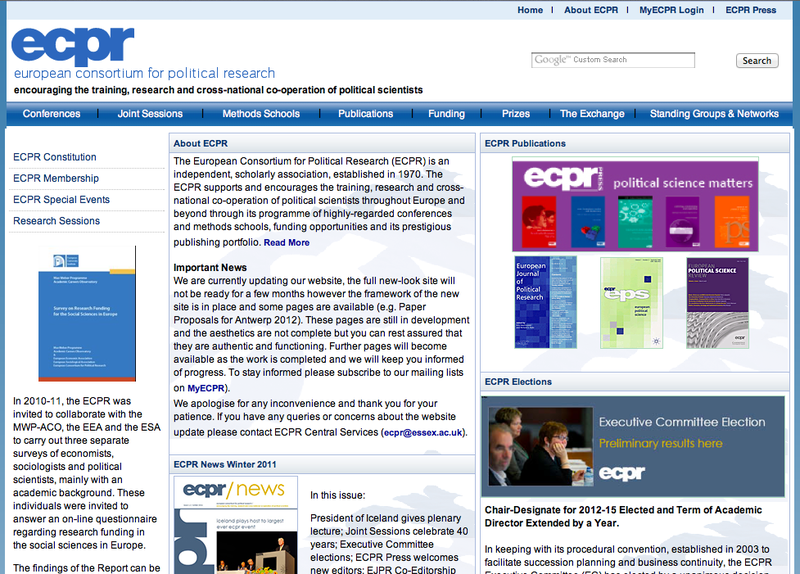 The European Consortium for Political Research (ecpr) is an independent, scholarly association, which supports cross-national cooperation of more than 8,000 political scientists in over 400 institutions throughout Europe and beyond. The website provides detailed info about ecpr numerous activities (mainly workshops, roundtables, conferences and summer schools organization, and publishing of journals, books, and newsletters). In particular, a rich archive – directly and fully accessible and downloadable in the original format for free by all users – collecting the conference papers from 1999 has been recently made available. Direct and free access is possible also to standing groups webpages, as well as to full-text issues of European Political Science, the ecpr professional electronic journal. Also a member directory (a database with political scientists in ecpr member institutions) with contact details of institutions and single scholars, is freely searchable as well as a subscritpion to the ecpr electronic bulletins. 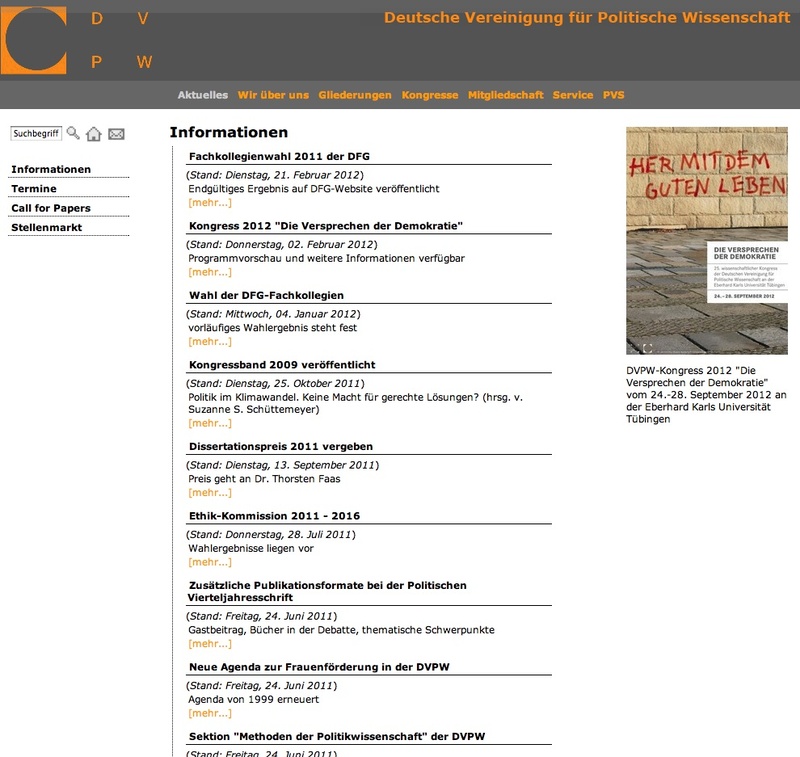 In addition, details on job markets, PS publishers and publications, news on conferences of interest to ecpr members and comprehensive European information for political scientists are also presented in the website. The newly designed website interface allows for easy orientation even if navigational aids are not highly developed. Through the improvement of its network and the expansion of its membership, the association will enable students of political science to evolve into critical individual, which will be able to take an active role in our society. Aimed at fostering cooperation among political science students through a global communication network, this site works as a starting point to build a large network of local societies and to organize an exchange of information between those organisations (by means of e-mails, internet, phone and ordinary mail). 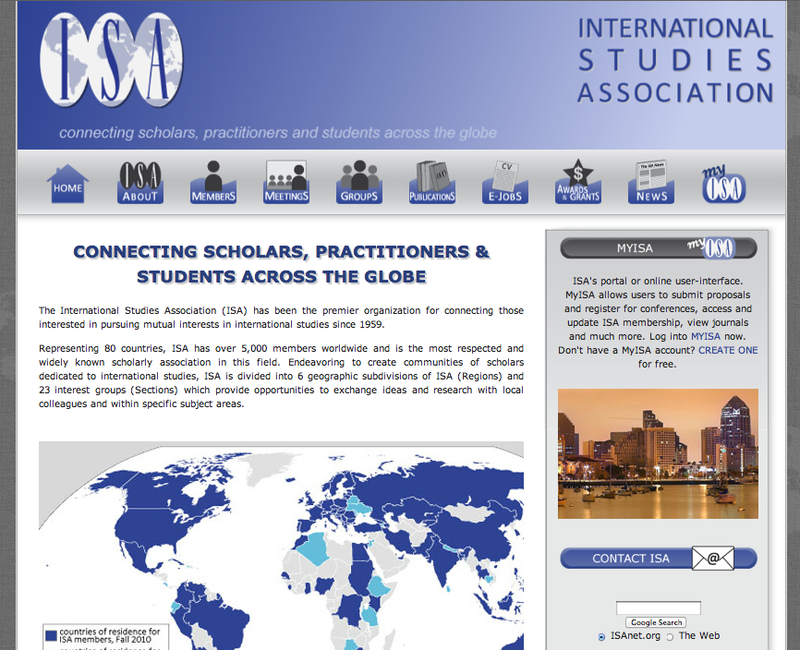 The site makes easier for students to find news and contacts for international study programs, to access useful information and data, and in general to facilitate a more global view of acitivities and worldviews related to Political Science activities. With institutional information about the association (working groups, projects, publications, etc.) and a good amount of related news items, this site is quite helpful for PS students worldwide and features a great updating rate through its weblog. In the same logic of its first partner – Federica, the WebLearning platform of the University of Naples – the whole site content is open and free to the public, with most material easily saved on-screen and a great amount of internal links used as tools to develop and support the International community that is the backbone of the entire project. 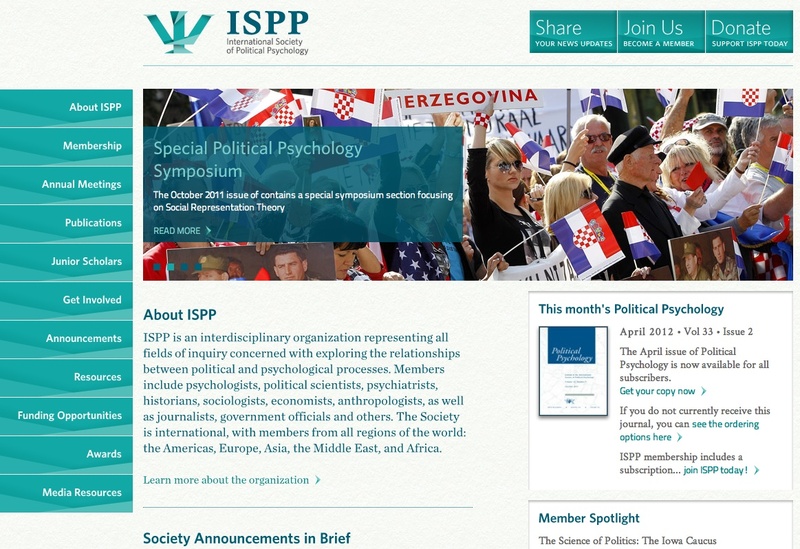 Based at Syracuse University, New York, the International Society of Political Psychology (ISPP) is an academic association with an interdisciplinary approach and the aim at fostering research and studies upon political pshicology and all possible related topics. Founded in 1978 the association counts now over 800 members coming from all regions of the world, from the Americas to Europe, from Asia to the Middle East and Africa. The ISPP website mainly provides access to general and membership information, paper and newsletter abstracts, and other contents related to the ISPP activities. Sample articles from back issues of Political Psychology, the journal of the association, are also retrievable in pdf format, as well as annual meetings’ programs, summer courses leaflets and thematic bibliographic references. Materials and information can be retrieved by an on-screen saving or be downloaded when a pdf format is available. A great variety of external links, pointing to resources in tune with the association’s overall interdisciplinary approach, is provided. Under a basic design – neither search or help options are included nor really needed – the ISPP website is easy to navigate, its contents are immediately to be located and its overall structure is extremely intuitive. Users at any level of expertise can orientate in this website.